The potential role of higher education in ‘activating’ city centres all over the world, as opposed to generating conflict between ‘town and gown’, was highlighted at the launch on Sunday of UCL Urban Laboratory’s Urban Pamphleteer #4, dedicated to issues around the rapid redevelopment of the historic centre of Doha, Qatar. 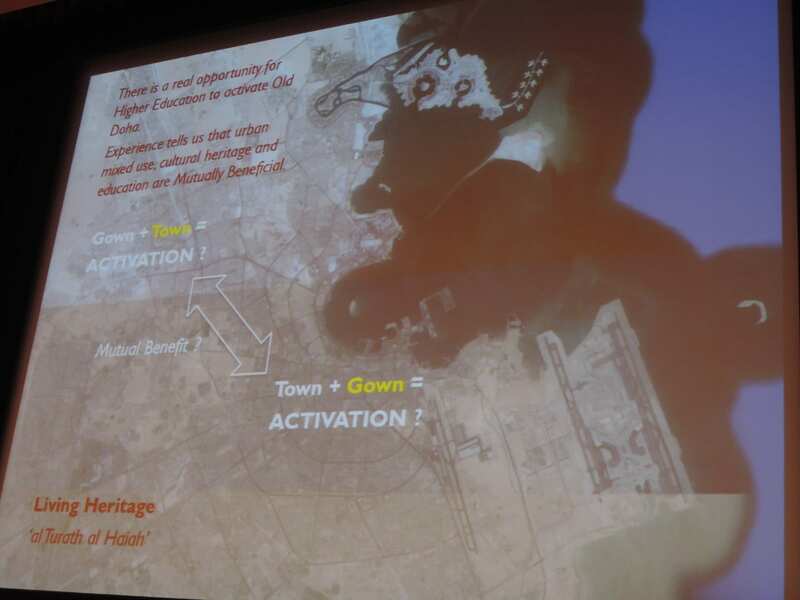 The event, held at Doha’s most recognizable landmark, the Museum of Islamic Art, concluded with a presentation from Tim Makower, a British architect based in London and Doha, who stated ‘there is a real opportunity for higher education to activate old Doha. Experience tells us that urban mixed use, cultural heritage, and education are mutually beneficial’. Makower, who played a central role in the masterplanning and design of Doha’s fast emerging Msheireb Downtown development, was also the driving force behind the Old Doha Prize (2013) organised in Doha in collaboration with the British Council, UCL’s Bartlett School of Architecture, the RIBA, and Qatar Museums Authority. 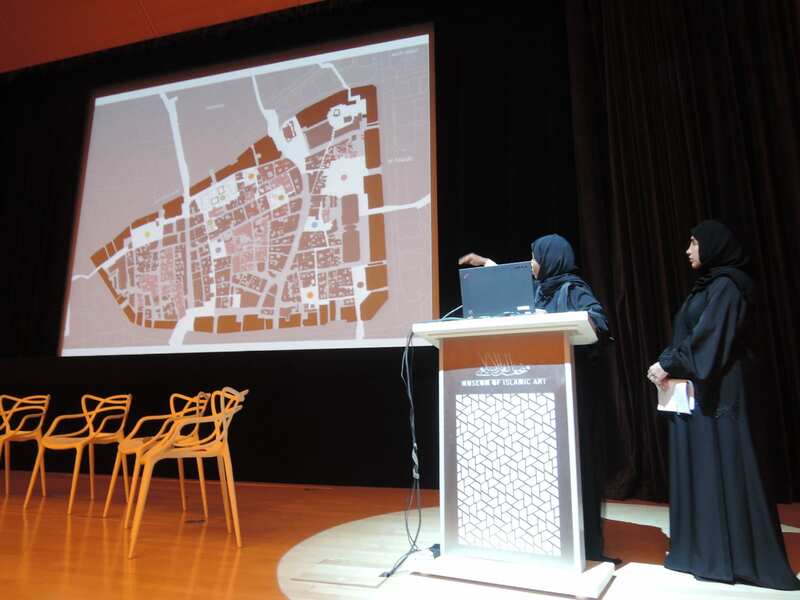 The competition, which paired selected Qatari and British collaborators, asked teams to make proposals for a sustainable, heritage-led regeneration strategy for the Al Asmakh neighourhood on the boundary of the Msheireb development. 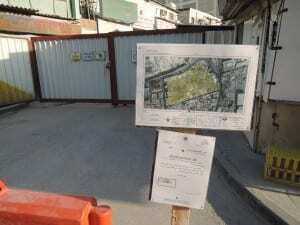 The fate of this neighbourhood, comprising narrow streets of dilapidated old mudbrick courtyard houses, small local shops, and some newer structures, inhabited by a long-standing, recently evicted, community of Doha’s migrant workers from Nepal, India and Sri Lanka, had been under question for some time. The winning team, youandme architecture from the UK, with Fatima Fawzy and Alaa Larri from Qatar, came up with a strategy for sensitive redevelopment which puts education at its heart. The hope is that Qatar’s planning authority and government officials will be influenced to produce plans for the Al Asmakh area, now an exclusion zone marked off by barriers, which take some of these ideas on board. Urban planning in Doha has been dominated by a zoning-based approach for many decades, resulting in a highly segregated city where residential areas, shopping and leisure zones, and commerce occupy clearly bounded territorial areas. Doha’s higher education facilities are concentrated in two principal zones, that of Qatar University near West Bay business area, and the newer, ever-expanding, Education City campus – a 20-40 minute drive from the centre depending on the traffic, with no public transport links. Education City includes a number of ‘branch campuses’ of mainly US universities, plus UCL Qatar, a postgraduate centre for studies in heritage, museums, and archaeology, as well as Qatar Faculty of Islamic Studies, and the Qatar Foundation. It is co-located with Qatar Science and Technology Park, where it is hoped that university-generated research will undergo commercial application. It is also the home of Qatar Academy, an all-through school geared towards university entrance, the Qatar National Library, a stadium, and extensive residential student accommodation. The Education City campus is notable for its pleasant, peaceful gardens and open spaces, a collection of remarkable buildings designed by top-ranking architects such as Legorreta, Koolhaas, and Isozaki, and a wide-ranging programme of educational and cultural events. Qatar University is also architecturally noteworthy, designed by El Kafrawi, recipient of an Aga Kahn award – and currently expanding on its own campus. But both sites lie at a distance from the city centre, drawing both people and teaching and research-related activity out of it. Both Makower and the Old Doha prize winners, speaking at the Urban Pamphleteer launch, agreed that the current regeneration of the city centre could benefit greatly from a re-integration of ‘town and gown’, animating the central areas with a range of education-related activities at the core of a new mixed-use approach to development, leavening the historic emphasis on city-centre business and retail: ‘Student life and education have a proven track record to regenerating areas. They can also enable a step-by-step regeneration that adapts to its socio-economic context. In Doha, zoned areas such as Education City and Katara Cultural Village, positioned on the edge of the city, take away a lot of life and activity from the centre. Why not have these activities happening right at the heart of Old Doha?’ (Alicja Borkowska, youandme architecture). 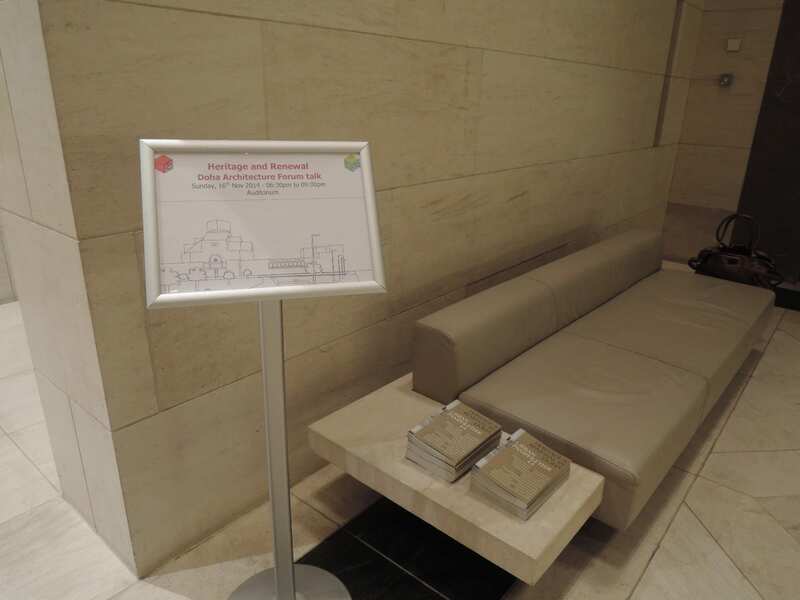 For further information: Urban Pamphleteer #4: Heritage and Renewal in Doha, guest-edited by Clare Melhuish, series editors Ben Campkin and Rebecca Ross, available in print and as a digital pdf. The CityAge: Global Metropolis event in London highlighted common challenges faced by cities around the world, along with the instrumental role of universities in delivering the potential for urban development through science and technology research, innovation and commercial translation. Bringing together some high profile speakers, including Alicia Glen, New York’s Deputy Mayor for Housing, and Boris Johnson, Mayor of London, it demonstrated that cities as similar and diverse as London, New York, and King Abdullah Economic City in Saudi Arabia, are looking to higher education establishments to generate activity in these fields as part of an overall strategy for urban growth, quality of life, and prosperity. And also that new graduates in the tech and innovation industries are showing a strong preference for urban centres as places for integrated work and living over the out-of-town science parks and campuses developed during the last decades of the last century. As Glen put it, ‘Silicon Alley’ has become more appealing than Silicon Valley. In New York, the opening of Cornell Technion University on Roosevelt Island is part of a major drive to attract talent in competition with new innovation cities such as Austin and Denver and diversify the city’s economy, which currently relies on a few high impact industries. The finance sector notably accounts for 30% of the city’s payroll, but only employs 9% of its workers. Combating inequality has been recognised as central to maintaining New York’s competitiveness. This includes not only creating new jobs in the tech sector, focused on physical innovation clusters around the city, but also making changes to planning and land use policies, and imposing ‘aggressive, mandatory’ obligations on developers to provide affordable housing (subsidised by the city authorities) in order to stop low-income and middle-class citizens being squeezed out. In addition, it requires heavy investment in infrastructure across the five boroughs to re-align historic transportation systems with the locations where people are living and working today. Noting that the challenges between London and New York are ‘remarkably similar’, Glen’s comments prefaced Johnson’s announcement of a new name for Cross Rail 2 – the Winston Churchill Line – and a commitment on the part of City Hall to finding half the £20bn funding required to ensure completion by 2028. Johnson stressed the importance of the line to supporting a 15% increase in the number of people able to access London’s central economic zone within 35 minutes, as well as ‘tens of thousands’ of new homes in the Lea Valley. These fall within designated Opportunity Areas created to ‘make housing work’ through mixed-use development – typically ‘city fringe type areas’, as Ed Lister put it, which appeal to tech companies, and are also tempting some of London’s major universities (cf UCL East and Imperial West) to put down roots as potential anchor institutions for new innovation clusters with local as well as wider economic impact. As in New York, these developments have involved re-thinking urban land use and planning policy, and are highly structured by local development plans and masterplans. But a word of warning was offered by Fahd al Rasheed, CEO of King Abdullah Economic City. As one of five new planned cities in Saudi Arabia designed to host new investment in science, technology and related industries, in order to diversify the oil-based economy and create jobs, it incorporates a new multi-university campus and the King Abdullah University of Science and Technology, to support the development of home-grown, globally competitive, talent. However the original masterplan was, said Al Rasheed, ‘over-engineered and not ecological at all’. In his words, the process had taught them ‘one lesson: never stick to a masterplan; it only tells you what you should not do’.